We send loads of great stuff via email: offers, top traded lists, the pick of our blog content, competitions and much more. Occasionally, though, our emails might not get to you as we intended. You might not be able to see all of the images, or it might land in your spam folder. Luckily, most of these issues can be fixed by adding us to your Safe Senders list. Here’s a quick walkthrough for all of the major email providers (drop us a comment if we’ve missed your provider and we’ll update the post!). ● Enter musicmagpie@e-musicmagpie.co.uk into the ‘Address’ field and click ‘Save’. ● Select ‘Add musicMagpie to Contacts list’ from the drop down menu in the top right corner. ● Verify the contact details and click ‘save’. 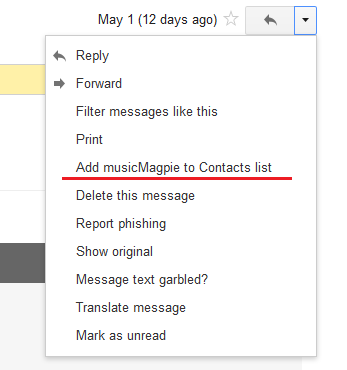 ● Drag any musicMagpie email you receive into your ‘spam’ folder into your ‘inbox’. This should remove any spam settings and ensure all of our emails land in your inbox. ● Go to the ‘Home’ tab and click ‘Junk’. You’ll find it next to the ‘Delete’ button. ● From the drop-down menu, choose ‘Junk E-mail Options’ then click on the ‘Safe Senders’ tab. ● Click ‘Add’ and enter musicmagpie@e-musicmagpie.co.uk. Click ‘OK’ to complete the process. If you’re having any issues viewing or receiving musicMagpie emails, please don’t hesitate to get in touch. Just click here to contact us. I would like to change my address AND my email address, but I do not appear to be able to change my email address and when I change my address, is doesn’t reconcile to the email address. Please can you tell me how to change my email address. Please get in touch with our customer services team at enquiries@musicmagpie.co.uk or by calling 0330 223 0989 and they’ll be able to change it for you.